If that brief description doesn’t leave you with shivers of ecstasy down your spine and the faint taste of vomit in your mouth, the cover art most definitely will. 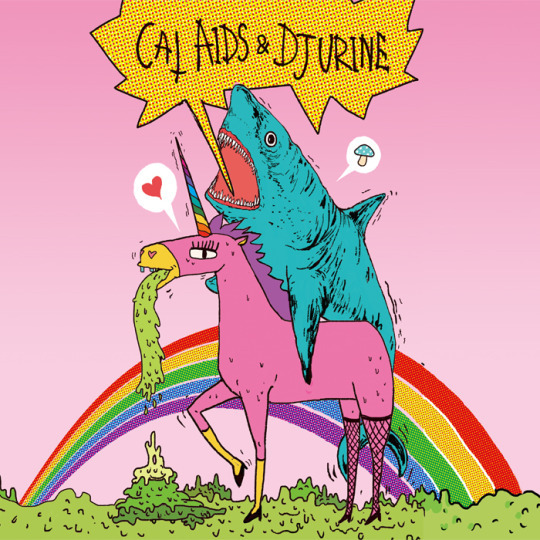 It features artwork from Nan Guazi and depicts a puking unicorn carrying a shark with a rainbow in the background; your basic LSD-induced vision. With such an impressive entrance, expectations are high for this record, however, upon first listen, the record doesn’t live up to the promise of weird and fantastical. That’s not to say that the music isn’t good though. CAT AIDS contributes to the A-side of the record with 7 tracks. They describe themselves as ‘the best band in Beijing’ and there’s nothing in this album that makes me want to disagree with that proclamation. The band generally features some really grungy elements that bring to mind images of a garage band on the brink of musical genius. Most songs are very bass heavy and the bass-lines often overpowering any other melody. It was almost as if the instruments had swapped roles and the bass guitar shone while the shrieking guitar fleshed out the background of the songs. The drums are ever present and is really what keeps the whole album from falling apart because of excessive experimentation and ties it all together. The rhythms are constant and seem to even flow into the song and the one after. One thing I really enjoyed about CAT AIDS was that even under all that intensive inventiveness, it really felt like the band was trying to make a statement and give a message through their music. All tracks, except Hand Transplant which is a spoken word track, feature screamed vocals which really emulates old-school punk bringing along a sense of rebellion and love for non-conformists even if at times it is near to impossible to understand the lyrics. Selfish Nation especially stood out with the lyric “Let’s take a selfie just you and me”, commentating on this generation’s use and portrayal of self on social media. The band uses dissonance frequently throughout their tracks and really helps to emphasis the hard-hitting ideas behind the songs as it creates a sort of disconcerting effect sort of like when your head is still ringing an hour after a really good concert. However, the same cannot be said for DJ Urine’s contribution to the record. The 20 minute long track doesn’t really have anything of interest as it sounds like constant feedback from a malfunctioning microphone. It was clear that the track was made in the same style as Hand Transplant from CAT AIDS but it really missed the mark or maybe was just too experimental and went a tad over my head. In fact, at some point during the 20 minutes a voice asks “Were your ears bleeding a while back?” However, if the speaker meant CAT AIDS’ tracks I would have to respond in the negative as I thoroughly enjoyed the slightly uncanny twist that the band put on grunge music. They’ve really taken the genre and torn it to pieces and reinvented their own interpretation.